Growing up most of the kids I knew looked up to athletes or musicians, I always seemed to be interested in the two Steves who founded Apple. Can’t really explain why, but always was interested in them both and their company. There was just something cool about it, especially when I was growing up. I kinda got away from technology for a bit in the mid nineties. I’m not sure exactly why. Apple was in pretty bad shape at the time, and a Windows world just didn’t seem very fun to me. When Steve Jobs came back to the company, that’s when I seemed to get excited about the industry again. I remember making sure that I’d watch all the MacWorld live streams. I remember getting more excited than I should have been at the new announcements. It really was amazing to follow a company pretty much written off for dead to some how turn around and become the monster that it is today. 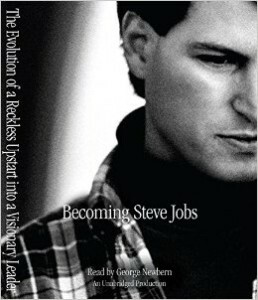 So when I saw another biography on Steve Jobs I picked it up without hesitation. I’ve read the Isaacson biography which was good, but this one I thought went into more depth on the guy as a person. It was a really good book. I felt like it went into a lot more of his later life and not just the amazing tales of him being a genius-jerk during the late 70’s and 80’s. His story of amazing rise, to fall and then to somehow even rise higher in the end is really more of a Hollywood story than real life. Very interesting book.